Today the world is shown another story of our society’s failure to take breach of trust incidents seriously. Former Chief Marshal Belfield Randolph McCollin, who dipped into Government’s funds “as if they were his personal piggy bank” was handed a suspended sentence for seven convictions. The Court of Appeal found that the sentence by Mr. Justice Christopher Blackman was too lenient, but there is nothing can be done because the Director of Public Prosecutions, Charles Leacock, did not appeal the sentence. As it is, the crooked Mr. McCollin as a long time career civil servant will probably even keep his pension. In Barbados public life we didn’t even say the words “Integrity”, “Transparency” or “Accountability” until it became fashionable in the last few years. But even though we say those words, every facet of our society declares the truth: we seldom hold people accountable for wrong doing, and further, we refuse to structure our government and business environments to make it easier to uncover wrong-doing and hold people accountable for their actions. We don’t even have rules against the most basic conflicts of interest – for instance, there is no rule against an elected or appointed government official receiving a substantial gift from a person who is awarded government contracts from that official. Our rules for corporate governance, financial institutions and the securities industries are laughable when compared to North America and Europe. Our government operations are not transparent and successive administrations have refused to put laws in place that would allow the citizens to hold government officials accountable. Even our Chief Justice is a long time professional politician who was appointed to give the then BLP government control over the courts. Every Bajan knows or senses that the corruption in government and the corporations doing business with the government reached unsustainable levels in the last few years of the previous BLP administration. There was massive fraud and mismanagement in a number of huge national projects. Consider just four: the GEMS Hotel Scandal, the ABC and flyover construction, Dodds Prison and Kensington Oval. These projects add up to hundreds of millions of dollars – and we know that fraud occurred in each project. In the case of the the ABC/Flyover (3S) and the prison (VECO), both contractors have a proven record fraud and kickbacks in government contracts, yet our government declared that everything was ok here. In the case of VECO and 3S, massive quantities of evidence exists in other jurisdictions that would probably undoubtedly send a few Bajan big-ups to jail. But there was and will be no investigation by Barbados. No inquiry. No transparency to the public. The Thompson government will not be requesting this evidence because it does not want to hold members of the last government to be personally accountable. Probably something to do with throwing stones in glass houses. Or as a cynic would say – Honour among thieves. The Thompson DLP Government will not seek to hold anyone personally accountable for the well-known excesses of the last government, nor will they implement EFFECTIVE Integrity, Transparency and Integrity Legislation (ITAL) during their tenure. This Bajan culture of corruption, of not putting anti-corruption measures in place and of not holding anyone personally responsible for wrong-doing is being noticed on the world stage. Foreign investors look at levels of corruption, but more importantly, they look at how our society and our courts deal with corruption – because that is an indication of what they can expect if all is not smooth sailing when they do business in or with Barbados. Increasingly, the sad and dangerous truth is this: When people at certain levels are talking, the phrases “banana republic”, “you can’t trust Barbados” and “I’d be careful if I were you” are now being heard. This article was written by Marcus and Abidan, a friend from New York City. A July 2005 holiday in Barbados turned into a tragedy as a British couple watched their only child shot to death by armed thugs who had broken into the family’s villa. Daniel May was 19 years old when he went to help his father who was being beaten. He was shot twice in the chest and died. The two thugs had stalked the family and waited for them to return to rob them, but the family fought back. Andrew Leroy Lovell was sentenced to 25 years in jail for manslaughter. The British newspapers say that the Barbados court found the shooting was “accidental” – and Daniel’s parents are outraged. I am not a lawyer, but any damned fool knows that when you arm yourself with a handgun, and then wait for a family to come home to rob them, and then shoot a young man twice in the chest… it is no bloody accident. Mr. and Mrs. May are understandably upset at the horror of the loss of their only child, and they have said some rather uncomplimentary things to the British newspapers about Barbados, and our courts. The accomplice, a piece of trash named Marlon St. Clair Mayers, is currently awaiting sentencing – which Mr. and Mrs. May say should be hanging by the neck until he is dead – along with Lovell. 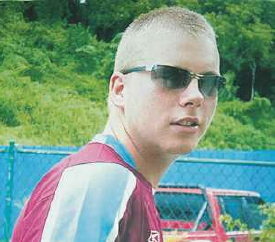 The British papers say that Daniel May was the first British tourist to be murdered on Barbados – within memory anyway. Our friend John rightly points out that the Barbados media has ignored this case. No mention of Daniel May’s name is to be found in the archives of the Nation Newspaper. Just another case of the lapdog Barbados news media exhibiting an agenda that has nothing to do with being a professional news organisation. Suppression of important news stories is normal and a frequent occurrence in Barbados.